Step away from the buffet and try something different! 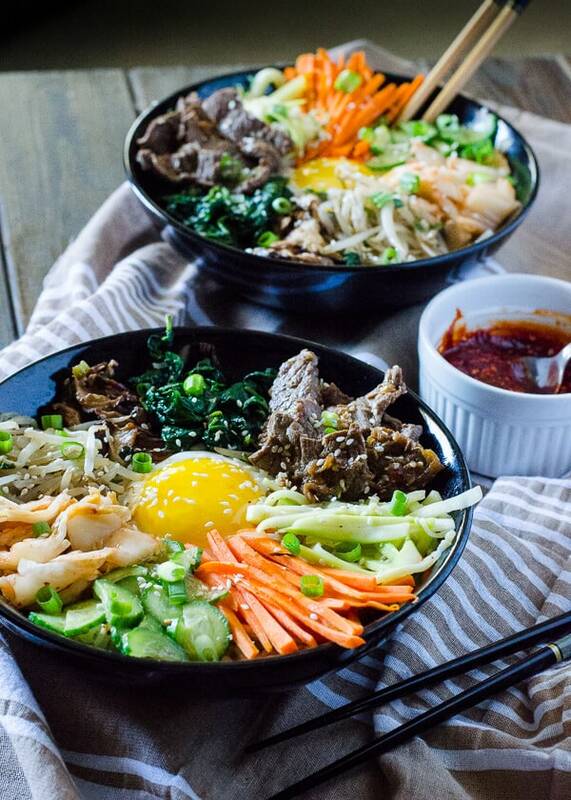 This Korean Bibimbap recipe is an Asian food lover’s dream – a bowl full of crispy rice, lots of sautéed veggies, a fried egg, and some thinly sliced beef, all drizzled with a spicy sauce. 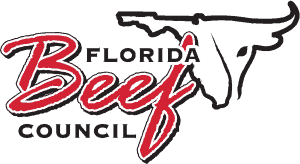 This post is sponsored by Florida Beef Council in conjunction with a social media campaign through Sunday Supper LLC. All opinions are my own. I’m pretty sheltered when it comes to Asian food. As a kid, it just wasn’t something I got to eat a lot of. My Polish Nana was a big proponent of cooking at home, and she wasn’t exactly what you’d call a Chinese food connoisseur. For her, meals were all about very simply seasoned meat and potatoes, so that’s what I was used to. In college, I was finally able to kind of branch out and try new things – bibimbap being one of them. 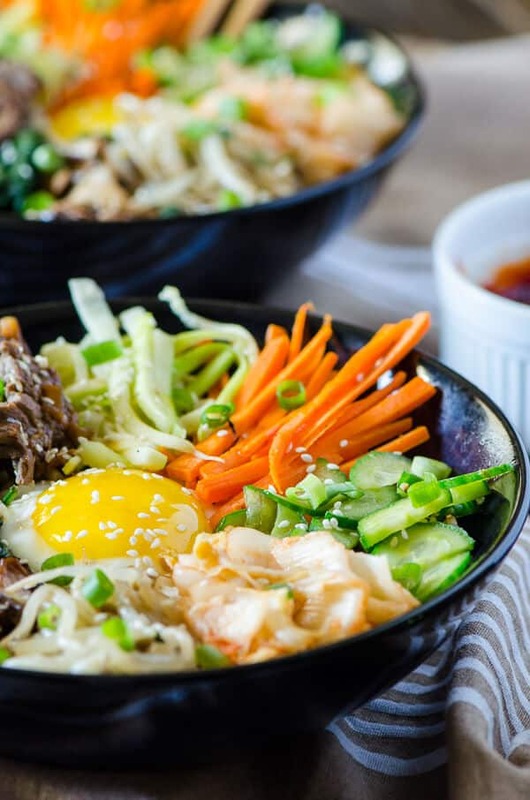 So – what the heck IS Korean Bibimbap? Who knew a bowl full of rice, vegetables, and some protein could be so different and so delicious? 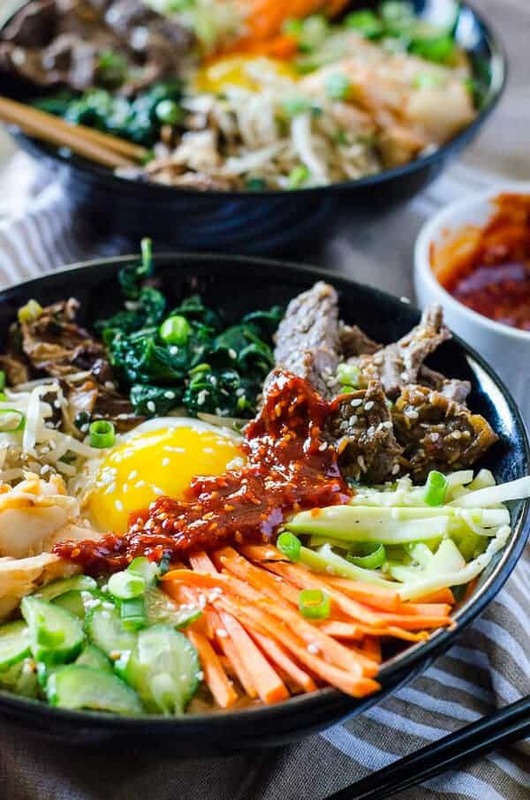 That’s really all bibimbap is – literally ‘mixed rice.’ It’s a traditional Korean lunar new year meal, in which everyone would get together and basically toss all of their leftover side dishes in big stone bowls and share a meal before the new year. Here in America, we call that ‘the kitchen sink.’ Or casserole. 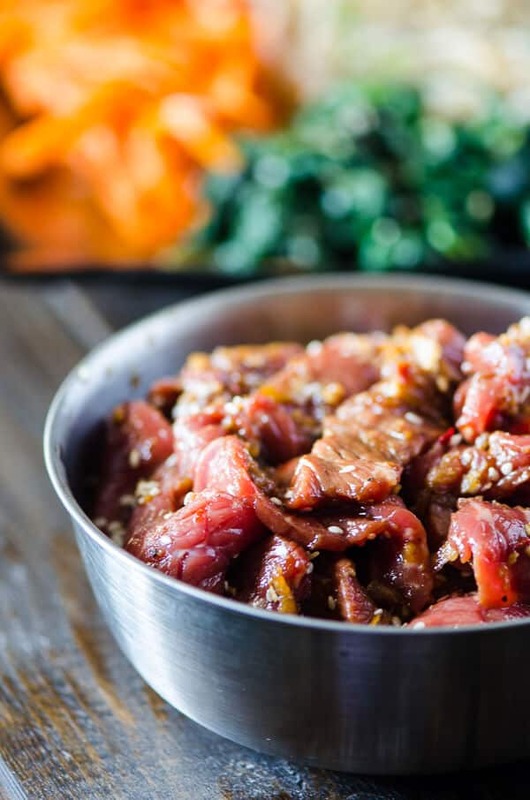 What kind of meat is bulgogi? I generally try to do a little research on a foreign dish that I’m trying to recreate. While trying to make it my own, I don’t want to depart completely from what it should be. At least not the first time I make it. Which is why my beloved beef only plays a part in this bowl, instead of being the star. 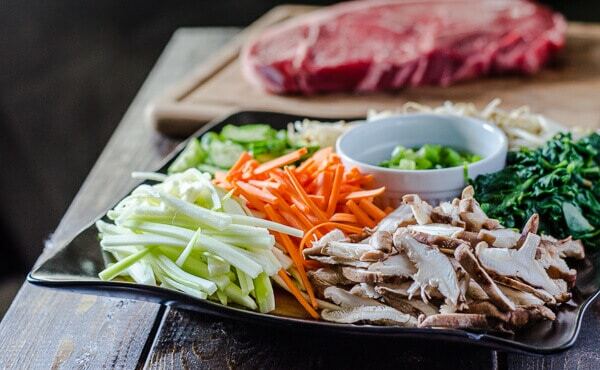 Bibimbap usually contains beef bulgogi, because you’ve really gotta get some protein in this pretty display somewhere. Something like 50% of your recommended daily value of it. Not only are you taking care of over half of your protein needs, but these lovely slabs of sirloin contain high amounts of zinc, iron, and vitamins B6 and B12, along with other key vitamins and minerals your body craves. And I promise, all those bad things you hear about beef are SO overhyped. Moderation is key in any food situation, and the piece of beef used in these bowls is probably about the size of your iPhone 6. 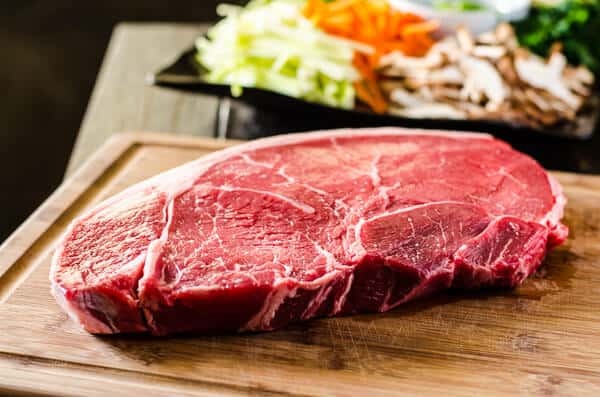 A single serving of lean beef is that size is about three ounces – so at the most, you’re gobbling up 150 calories and less than 10 grams of fat. 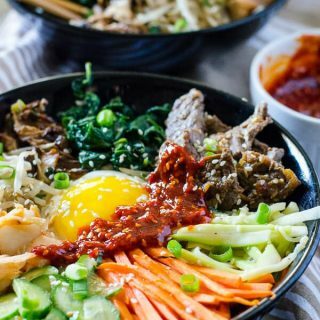 How do you prepare Korean bibimbap? Low-fat dinner for the win! Don’t forget about all of the gorgeeeeoussss veggies that are packed in here. The dark shiitake mushrooms and beef represent the kidneys, the red chili, kimchi, and carrots symbolize the heart. Zucchini, cucumber, and spinach represent the liver, and for the lungs, white bean sprouts and rice. Finally, the yellow egg in the center is symbolic of the stomach. And can we talk about that crispy rice for a second? I didn’t realize it was a thing outside of my hubby’s home country of the Dominican Republic (they call it con-con,) but there’s just something about the texture of overcooked rice that makes any dish better. As far as the spiciness of the dish goes, that’s all up to you. The sauce made from the red chili paste (gochujang <—affiliate link!) is definitely NOT optional (it’s just not bibimbap without it,) but serve it on the side so you can control your heat. 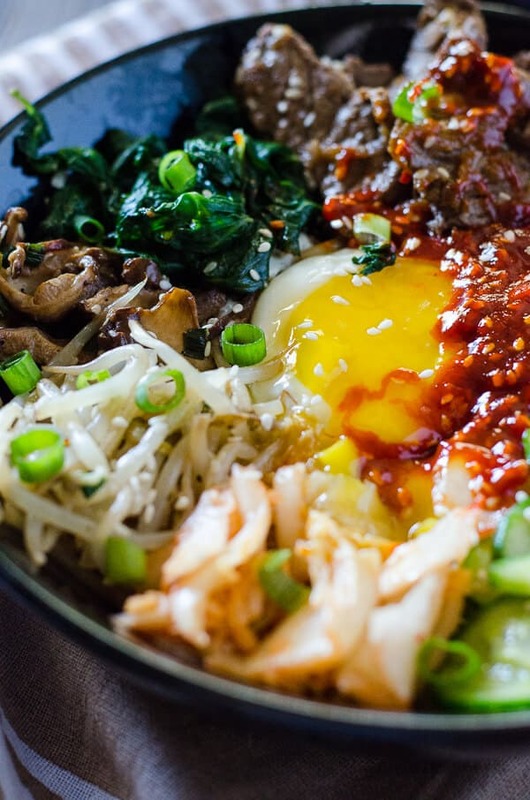 Is this Korean Bibimbap recipe up your alley? 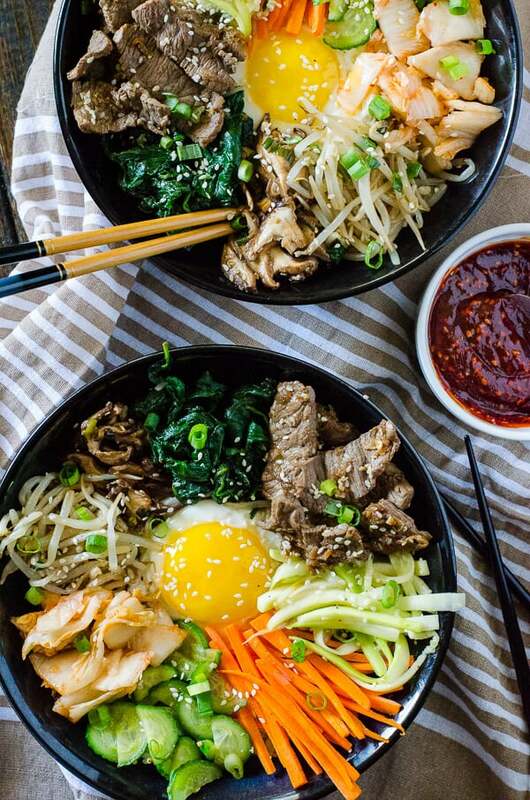 Try one of these other delicious Asian dinners! Step away from the buffet and try something different! 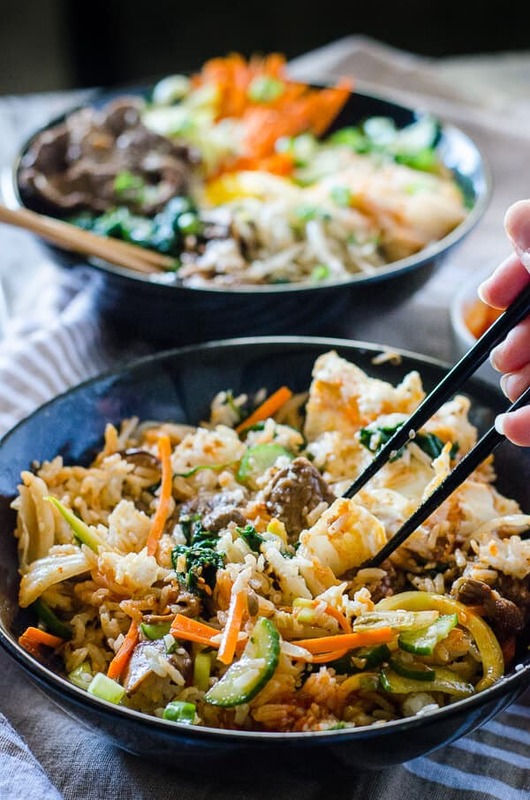 This Korean Bibimbap recipe is an Asian food lover's dream - a bowl full of crispy rice, lots of sautéed veggies, a fried egg, and some thinly sliced beef, all drizzled with a spicy sauce. Combine all ingredients in a zipper bag. Refrigerate, allowing to marinate for 30 minutes to 3 hours. Combine all ingredients in a small bowl, mixing until blended. Set aside. In a large saute pan set over medium heat, heat 1 Tablespoon sesame oil. Spread the steamed rice in the pan in an even layer and allow to cook for 10-15 minutes undisturbed until golden brown and crispy on the bottom. Remove from heat and set aside, or keep on low heat. In a pot of boiling water, blanch the spinach 1 minute until wilted, then drain in a colander. When cool enough to handle, squeeze out the excess water and set aside. In another pot of boiling water, boil the bean sprouts 4-5 minutes, then drain in a colander. Place in a bowl. Place carrots and zucchini in separate bowls; sprinkle each with a pinch of salt and allow to sweat for 10 minutes. Dry with paper towels and return to bowl. Separate remaining vegetable into bowls. Place green onions, oil, soy sauce garlic, sesame seeds, salt, and pepper near the oven workstation. Heat 1 teaspoon sesame oil in a wok set over medium heat. Add carrots and season with salt and pepper; saute for 2-3 minutes, then place on a large platter. Heat 1 teaspoon sesame oil in the wok. Add zucchini, season with salt and pepper. Add ½ tsp. garlic, 1 teaspoon green onion, and ½ sesame seeds; saute 2-3 minutes until crisp-tender, then place on the platter. Heat 1 teaspoon sesame oil in the wok. Add cucumber slices and ½ teaspoon of garlic, sauteeing for 3-4 minutes. Place on the platter. Heat 1 teaspoon sesame oil in the wok. Add mushrooms, season with salt & pepper, and add 1 teaspoon soy sauce, 1 teaspoon green onion, ½ teaspoon garlic, and a sprinkle of sesame seeds. Saute 3-4 minutes until tender, then remove to the platter. Heat 1 teaspoon sesame oil in the wok. Add blanched spinach, season with salt & pepper, and add ½ teaspoon soy sauce, ½ teaspoon garlic, and a sprinkle of sesame seeds. Saute 2-3 minutes, then remove to the platter. Heat 1 teaspoon sesame oil in the wok. Remove the beef from marinade and cook in 2 batches, 3-4 minutes, flipping once. Set cooked beef and juices in a bowl. Heat ½ teaspoon sesame oil in the wok. Add boiled bean sprouts seasoned with salt & pepper, ½ teaspoon garlic, ½ teaspoon green onion, and ½ teaspoon sesame seeds. Saute 2-3 minutes, then remove to the platter. When ready to serve, present family style, or portion the crispy rice into serving bowls. Place beef bulgogi with juices and assorted veggies on top of rice, separated to show off the colors and textures of the dish. Place egg on top, then drizzle with gochujang sauce, a little sesame oil, and a sprinkle of sesame seeds. 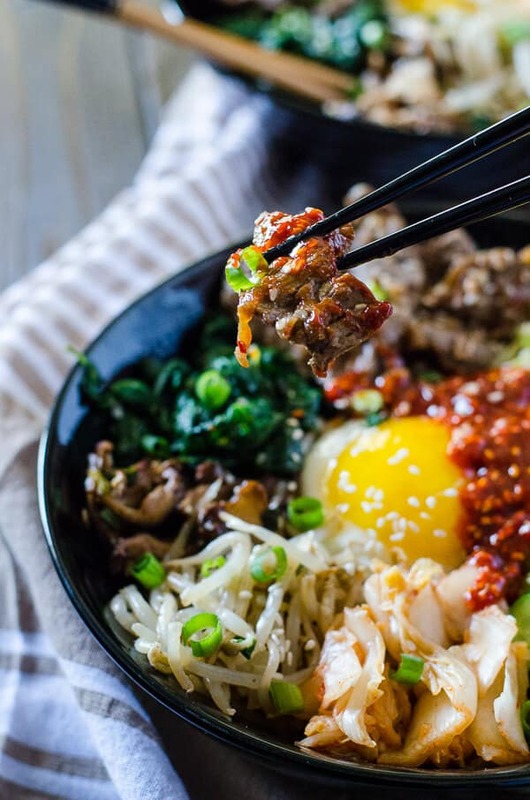 Mix everything together when ready to eat, adding more gochujang sauce and/or sesame oil as needed to moisten the dish. Enjoy! 15 incredible recipes featuring my favorite protein by my favorite people- what could be better?! I’m not seeing the actual recipe. I’ve seen other recipes for this dish before, but your photos make me want to try making this recipe. I’m drooling! This looks amazing! Your pics are gorgeous. Thanks so much for joining us on the #FLBeefImmersion weekend, Erica! Love spending time with you and can’t wait to get together again! I’d love to figure out serving size and calories! It’s so delicious and seems healthy 🙂 800 cals seems steep! You know, Meg, I have found my nutrition calculator to be a little on the off-side myself! I used this nutrition calculator here —> https://www.verywellfit.com/recipe-nutrition-analyzer-4157076 when compiling info for my cookbook, and I just plugged the numbers in here. 1 serving of the beef bulgogi is only 393 calories, and the label on the gochujang sauce I have at home says there are only 67 calories in 2 tablespoons of it. 70 cals per egg you add, and obviously the veggies will add some calories, but very minimally. I’d say even with a 1/2 cup of white rice you’re looking at closer to 650 calories, max. Take this with a grain of salt, since I’m no dietitian, but this is a very hearty dinner, filling for sure! I do hope you try it! This looks amazing and something I’d like to try, however I can’t see the instructions for the rice, how do you crisp it ? Is it any particular rice ? Thank you for sharing. Hi there Tamiko! I am so sorry for not including those instructions! I’ll double back and add them in, but the trick to crispy rice really depends on how you cook your rice! My husband has a steel rice pot that he coats with a thin layer of oil, then cooks the entire rice recipe in it. When the water boils down, he covers the top with a plastic bag or kitchen towel and places the lid back on. Leave the heat on low and allow the bottom 1/4 of the rice to brown and get a little crispy. It works similarly if you leave the rice in an instant rice cooker a little too long, but you won’t get that same golden brown crunch. If worse comes to worse, saute an even layer of it in a skillet in little bit of oil or butter – I would think that would do they trick also! I hope you try it and love it – thank you for commenting! I really love this recipe – it is as close as I could ever ask to get to a recipe served seasonally in a local restaurant. For anyone watching their sugar intake, I can attest that the recipe does not fall flat without the added sugar. The pear gives the marinade more than enough sweetness and I find that the gochujang sauce doesn’t miss it either. Thank you so much for sharing this dish!